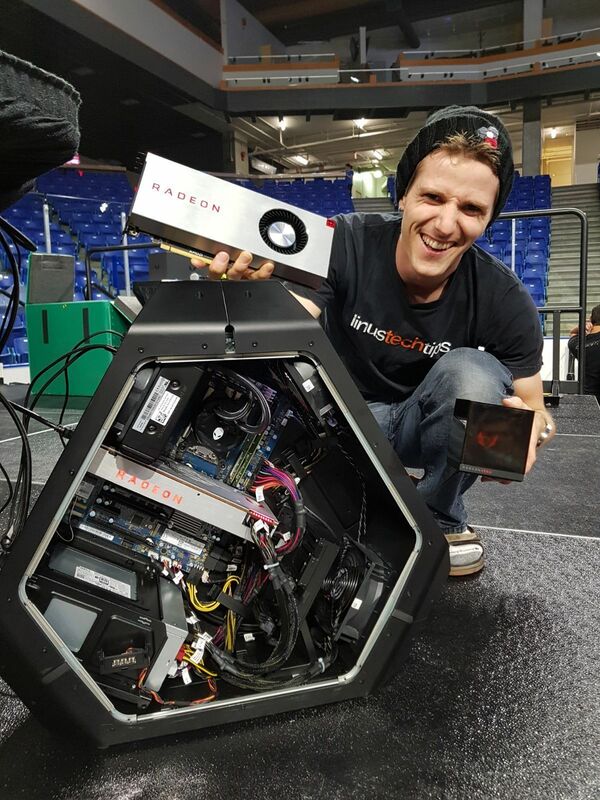 Popular tech YouTuber Linus Sebastian of Linus Tech Tips is infamous for dropping pricey PC hardware, but at the channel’s LTX2017 event in Canada on Saturday, he dropped an exclusive first look at AMD’s hotly anticipated Radeon RX Vega ahead of the graphics card’s promised launch at Siggraph this weekend. Even more interesting: The card revealed comes with a mysterious “Holocube,” as the Radeon Twitter account called it. It’s the nifty-looking red and black box below. Another post by the Radeon Twitter account shows RX Vega running inside an Alienware Area-51 system with AMD’s Threadripper processor. (Area-51 Threadripper PCs start at $2,999 on Dell's website.) 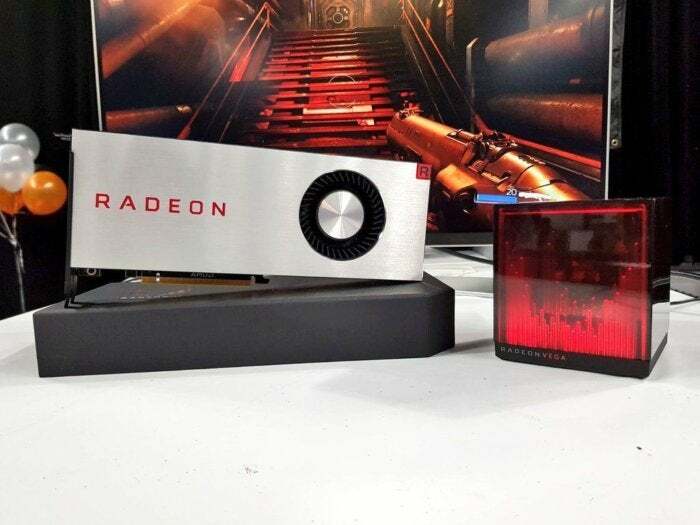 That glimpse reveals that RX Vega uses a pair of 8-pin power connectors and includes the fancy “GPU tachometer” LED lighting feature (also found in the Radeon Fury X and Vega Frontier Edition) to show you how hard you’re pushing the GPU at a glance. Click to enlarge this Radeon RX Vega image - it's easier to see the power connectors if you do. AMD hasn’t formally revealed many detailed hardware specs for these consumer gaming cards aside from the high-level Vega architecture preview at CES earlier this year. But with the expensive “prosumer”-focused Frontier Edition already available ($999 on Newegg), PC gamers can puzzle out a lot of what’s inside Radeon RX Vega—though I’m almost as interested in that Holocube now, personally. We won’t need to wait long for official confirmation though. 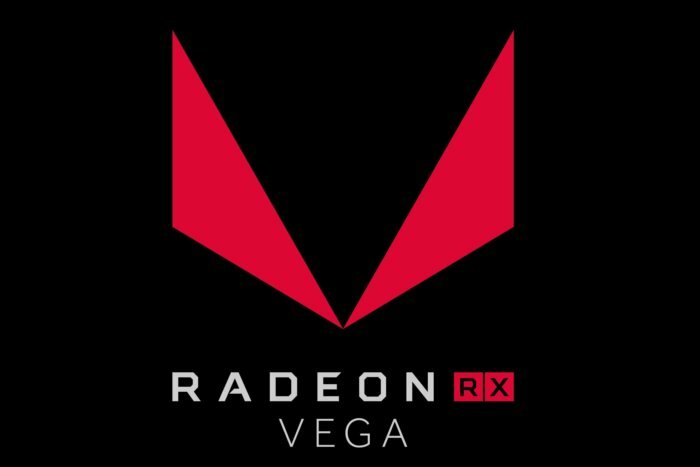 AMD CEO Lisa Su promised Radeon RX Vega will launch at the Siggraph 2017 event, and that starts tomorrow. Stay tuned.